In ’Berta Boys, Terrence worked with collaborators Aaron Brown and Gabriel Esteban Molina, as co-writers and co-performers to develop characters and actions based in and critical of the cowboy mythology of Alberta, and its icons. In the gallery, the work takes the form of a short film as well as several sculptural installations that connect to scenes and images within it. In an effort to explore the masculine archetypes found within themselves, the trio meditate on the oscillation between the inherent absurdity and tragedy that coexists in their unrestricted behaviours. 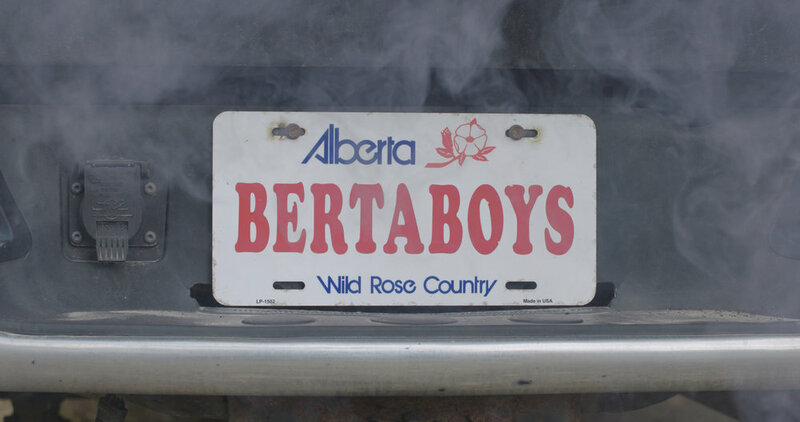 ’Berta Boys is funded in part by the Alberta Foundation for the Arts, the Edmonton Arts Council and MacEwan University. Kyle Terrence is a visual artist and filmmaker from Alberta, Canada. His practice explores the discourses of ecology, masculinity and theology, with a particular interest in the violent crossovers between them. Terrence received a Master of Fine Arts in Intermedia from the University of Alberta in 2016, where he developed his thesis work “Pilgrimage: being in the End times.” Terrence’s newest work “Berta Boys” is concerned with the consequences of the aesthetic fusion of masculine and economic identities in the region of Alberta, which he explores through an overlapping range of media including video, performance, sculpture, drawing and writing. Terrence is based in Edmonton where he currently teaches a variety of studio courses at MacEwan University and the University of Alberta. Aaron Brown is a multidisciplinary artist from Edmonton who holds a BA of philosophy from the University of Alberta. His practice utilizes a variety of mediums such as film production, performance and writing to engage with the intersections of transgression, desire and subjectivity. As a co-performer and co-writer of the Berta Boys project, his primary focus has been on how socio-economic class radically underpins hegemonic masculinity. Gabriel Esteban Molina is a Canadian visual artist from Edmonton, Alberta who graduated from the University of Alberta in 2013 with a BFA in Fine Arts. In 2015, he completed his Masters of Art in Fine Art at the Chelsea College of Arts in London, United Kingdom. He has had numerous exhibitions in Edmonton including a recent solo at Parallel Space and a solo exhibition in 2017 at Yamamoto keiko Rochaix in London, United Kingdom. He recently completed the Emerging Artist 2018 Residency at the Banff Centre for Arts and Creativity and will be undertaking a residency in Iceland in 2019.